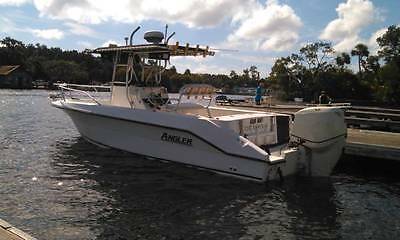 2000 Angler 2400 CC. Made in Florida 2008 Etec 225 with approx. 160 hours. Runs great and great on fuel. Bullet proof motor. 2006 Continental Aluminum tandem axle trailer with brand new tires. New upholstery. New custom canvas cover (cost $1,800) 15' Rupp outriggers, newly rigged, 2 lines each side. Furuno radar color navnet with auto-pilot. Furuno color sonar sounder. Garmin echo map 74SV. Stereo. 2 fish boxes built into the cockpit sole which are 10-inches wide, one foot deep and nearly six feet long. Windless anchor system. New vhf radio. Epirb Cat. 1. Large T-top with front and aft lights. Leaning Post. Rocket Launchers. Trim Tabs. T-bag (6) New cooler. Fresh and raw water wash-down. Sink with large fresh water holding tank. Large bait well. Marine horn. Please contact me to make arrangements to come out, see it and inspect it in person. 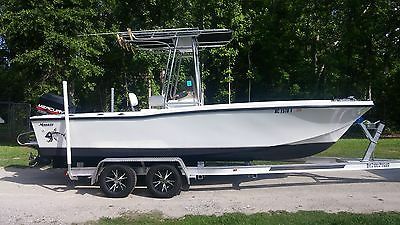 This is a great boat in great shape. Set up for fishing and or pleasure both offshore and inshore. It is now stored indoors high and dry at a marina in Homosassa Florida but was used in deeper waters off Port Richey. Has never had bottom paint. It runs great. Console has enough room for a portable head if you desire to get one. Serious inquires only. I hate to see this boat go, but a pontoon would be more suitable to where I now live. You won't find a better loaded boat in this price range anywhere. Asking $20,500 or best cash reasonable offer. No low ballers please. 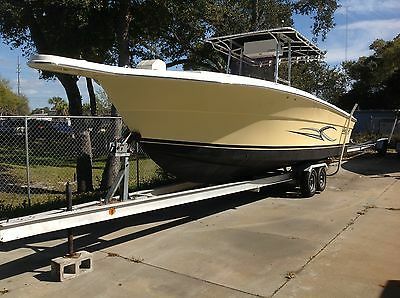 Up for offers we are selling this 2005 27 ft angler center console. This boat is powered with a pair of mercury 250 E.F.I motors which have just both been serviced and gone thru including all new ray core filters,plugs,impellers etc. Compression is strong and even. This boat runs out very strong and is very fast at approx 55 mph unlike most which are powered with 150's. Her motors are mounted on factory bracket which provides much more space as well as much better performance.Both lower units have been recently replaced, as well as canvas on Tee top. Interior cushions have no rips or tears and are in nice shape. Hull has been finished in Fighting lady yellow. All gauges ,pumps,hydraulic steering works as it should. 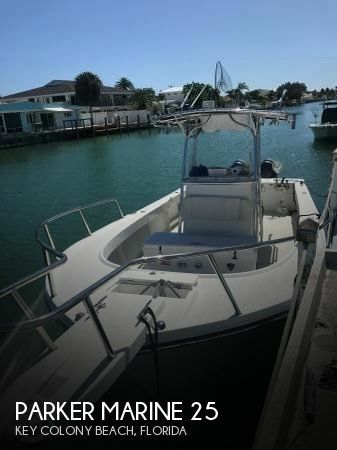 I was very impressed with the performance of this boat, if you are looking for an off shore fishing machine that will get you to your favorite spot quickly and dependably then you need to consider this one. This boat is being sold on the tandem aluminum trailer pictured she has a windlass which is not hooked up. Add your personal electronics and she is ready to fish. If you have any questions or would like to make a reasonable offer please call our marine line at 772-321-9007. This boat is priced to move way below her book value so please remember this is not an auction! As soon as an acceptable offer is received she will be sold and the listing ended. 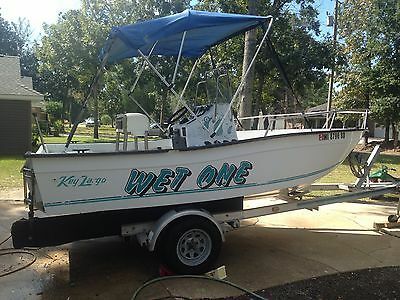 This boat I am advertising for a friend, buyer will deal directly with owner to complete transaction. Boat is turn key ready for use. Comes with all equipment which is life jackets,fire extingusher,anchor,ropes paddle,boat hook,six gallon fuel, tank new battery,fish finder,live well with airator pump,bilge pump and running lights. A new drivers seat was just installed alone with a new fish finder. Boat comes with galvinized trailer and spair tire.This boat will be sold to the highest bidder. Boat is also being advertised locally. I am in the marine repair business and have maintained this boat for my friend since he has owned it. 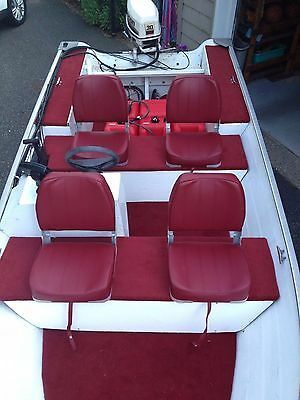 Boat is in very good used condition. 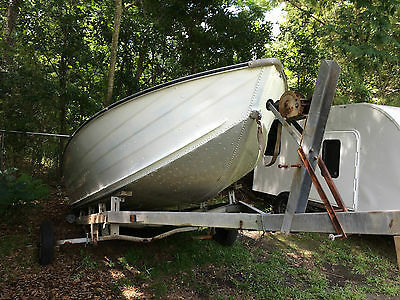 Boat is being sold as is in as is condition. 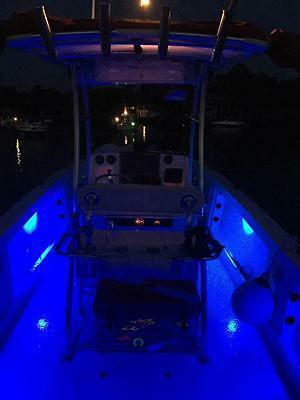 Tiara/Pursuit center console boat. Boat is used but in good sound condition ready to fish. Engines have approx 325 hrs on them. It gets 1.7-1.8 mpg at 32mph cruise. Tops around 50-54mph depending on load. It is a model 2550 actual length is 25 1/2 ft with a 2 1/2 ft bracket making it 28oal. Has HDS 5 gen2 lowrance with thru hull transducer also has a new b75 m chirp Garmin thru hull transducer. Interior led lighting and exterior underwater lighting. Taco Outriggers, fighting chair. Dive ladder with brackets on both sides of engine bracket. Scuba Cylinder brackets/holders. Am/fm CD 6 speaker stereo. I bought a bigger boat is why I am selling it. Trailer is magic tilt tandem axle with torsion axles. Aluminum wheels with spare and all new wiring with new LED lighting Sides and rear. Tires are in very good shape. New guide bunks and winch strap, trailer is in great condition. The Pro Team TF 175 offers quantity and quality for any angler who is serious about fresh water fishing. This boat was purchased new in 2013 from the Bass Pro Shop located in Orlando, FL. 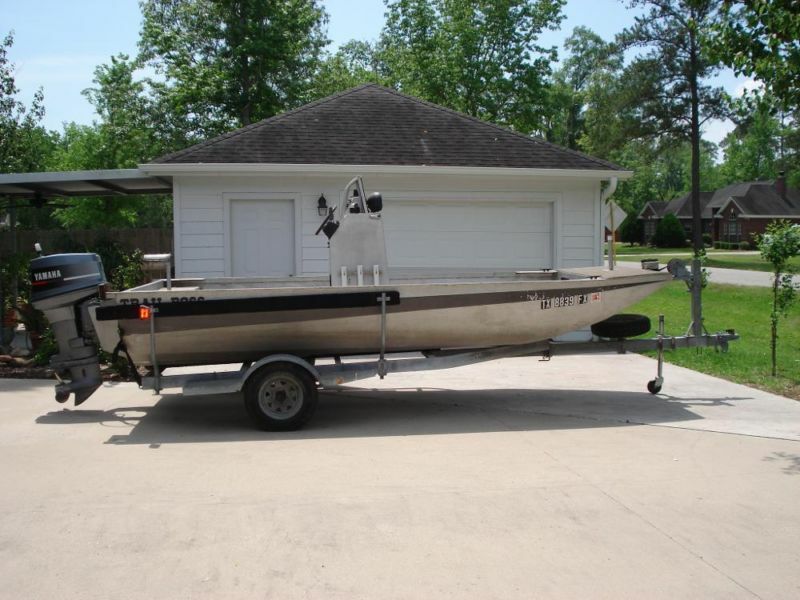 The boat has everything the serious angler wants in a boat without the huge monthly payments. All warranties are valid and are transferable upon purchase. This vessel has been garage kept since purchased and is in show room condition. 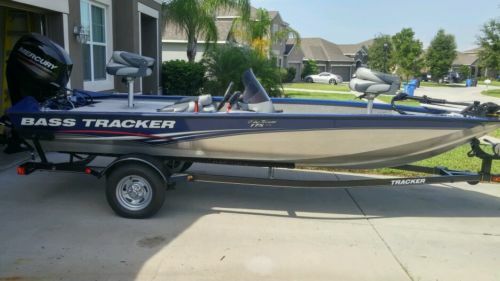 The Bass Tracker is equipped with a vinyl floor, (4) comfortable seats, a Lowrance X-4 Pro Fish Finder (console), another Lowrance Elite 4HDI (bow), (2) live wells, three additional storage compartments (located on the bow), two additional storage compartments located near the rear live well, 45lbs thrust trolling motor, and 60hp Mercury Four Stroke Engine (top speed 40mph).